Two small parks, Historical and Chambers Grove, sit within a stone’s throw of one another along the St. Louis River in the neighborhood of Fond du Lac, which is the oldest settlement at the western end of Lake Superior and the oldest established community in the city of Duluth. The roots of Historical Park lie in the first half of the nineteenth century, before the area was even part of the United States, while those of Chambers Grove Park are firmly planted in the Zenith City’s boom-and-bust growth spurts from just before its establishment in 1870 to its relative stabilization by 1910. Linked first by location, their stories became entangled by the creation of a Depression-era attraction built by the Civilian Conservation Corps. Historical Park has the unique distinction of being one of Duluth’s newest parks, but with the oldest history of any of Duluth’s public spaces. The tiny park—a single lot near the intersection of 133rd Avenue West and Second Street—was officially created in 2006 when Daughters of Liberty and Greysolon du Lhut chapters of the Daughters of the American Revolution (DAR) transferred ownership of the lot to the city. However, the space had been long been considered a park, and prior to 2007 its name honored America’s first multimillionaire. When French fur traders and missionaries arrived here in the seventeenth century, they named the entire region Fond du Lac or “Bottom of the Lake,” which the English mistranslated as “Head of the Lakes,” a term used to describe all of western Lake Superior until well after the cities of Superior and Duluth were established. The French also called Wayekwaagichigamiing Fond du Lac. The Ojibwe became trading partners with the French, but ongoing conflicts between the Dakota and Ojibwe interfered with the fur trade. Duluth’s namesake, Daniel Greysolon Sieur du Lhut, canoed to Fond du Lac from Montreal in 1679, intending to bring peace to the region and hoping to find a passage to the Pacific Ocean. On September 15, 1679, du Lhut gathered representatives of Ojibwe, Dakota, Cree, and Assiniboin peoples at Fond du Lac, encouraging them to hunt, feast, and intermarry. Within three years the Ojibwe and Dakota were conducting trade as far as 150 miles from Fond du Lac, but the peace was short lived, and by 1736 the conflicts erupted again. Along with the Ojibwe, independent agents licensed by France known as coureur des bois (“wood runners”) also trapped fur-bearing animals. Those who traveled by canoe became known as voyageurs. These independent agents later went to work for England’s Hudson’s Bay Company and the private North West Company. In the 1780s, the North West Company controlled the western Lake Superior region and established Fort St. Louis at the mouth of the St. Louis River in what is now Superior, Wisconsin; the post became the region’s center of trade. The fur trade changed dramatically after America achieved independence. In 1809 German immigrant John Jacob Astor formed the American Fur Company and set up a trading post at Fond du Lac adjacent to an Ojibwe village. Astor, considered to be America’s first multimillionaire, was a German-born businessman and investor who made his fortune in fur trading, selling real estate, and smuggling opium. While the Ojibwe preferred to trade with the French and British, the War of 1812 put an end to that, when, in the wake of the war, the U.S. Congress barred foreigners from trading in American territory. And so in 1816 Astor took over the North West Company’s interests in western Lake Superior and a year later built a new, larger trading post at Fond du Lac, managed by William Morrison. Astor’s facility eventually included a two-story trading facility, a granary, an ice house, a stable, a dormitory for traders, and the post commander’s house. The complex faced the St. Louis River near today’s 133rd Avenue West and included a cedar-post stockade that protected vegetable gardens and a graveyard. An Ojibwe village with a population of roughly 150 occupied Nekuk (“Otter”) Island directly across from the post. They kept vegetable gardens on nearby Amik (“Beaver”) Island. The fur post became a center of trade and a natural spot for gatherings. In 1826 Michigan territorial governor William Cass (namesake of Minnesota’s Cass County) and Colonel Thomas L. McKenney, the head of the newly formed United States Indian Department, traveled to Fond du Lac. 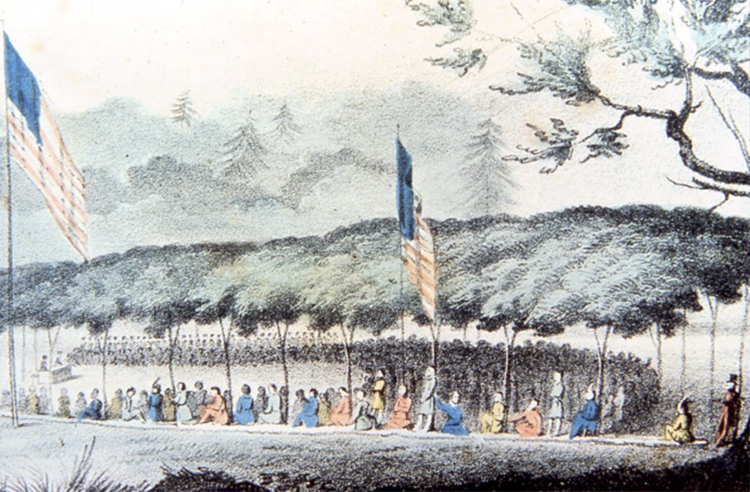 They gathered native leaders from throughout the region at Astor’s fur post to ratify the Treaty of Fond du Lac, designed to grant the U.S. rights to minerals exploration and mining within Ojibwe lands located in the region. In 1854, representatives of the United States government and the Lake Superior Ojibwe signed the Treaty of La Pointe, which ceded Ojibwe lands in northeastern Minnesota to the U.S., opening the area for settlement. It also created the Fond du Lac Reservation, 100,000 acres of land twenty miles west of Fond du Lac, and the Ojibwe population declined. In 1856 settlers of European descent, including Francis Roussain, established Fond du Lac Township and platted streets and building lots on the fur post site. Roussain had worked at the post and had built a home along the river adjacent to the stockade along today’s 133rd Avenue West. He and his fellow incorporators platted streets over the stockade’s footprint and homes were built on portions of the fur post site. The last of the fur post buildings fell into ruin and were reportedly destroyed around 1900, although there is evidence that some buildings may have stood until 1917. The change in the park’s name was deliberate—DAR representatives wanted to be more respectful of other aspects of the site’s history, particularly the native peoples who lived there. 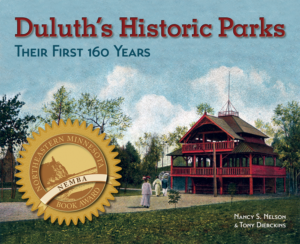 In 2010 another city council resolution made the park a Duluth landmark property. The resolution called the park “John J. Astor Park aka Historical Park” and newspaper articles referred to the park as “John Jacob Astor Park.” As of this writing, the city is again considering changing the park’s name to again include Astor’s name.